I love learning about earth based traditions. Thanks for the links. And this is a beautiful sketch. Are these sweet or savoury? What are the round objects? Maybe apricots? 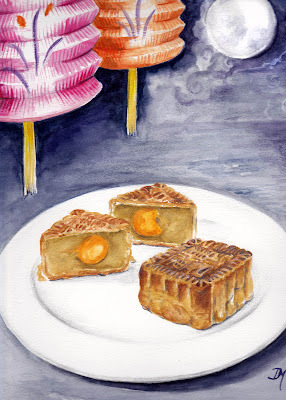 Mooncakes!!! Boy I love these and I hadn't had these for over 5 years until yesterday... I just had to order some from Amazon, and my wife tried it for the first time and she thought they tasted like peanut butter ^^ It's so true though!